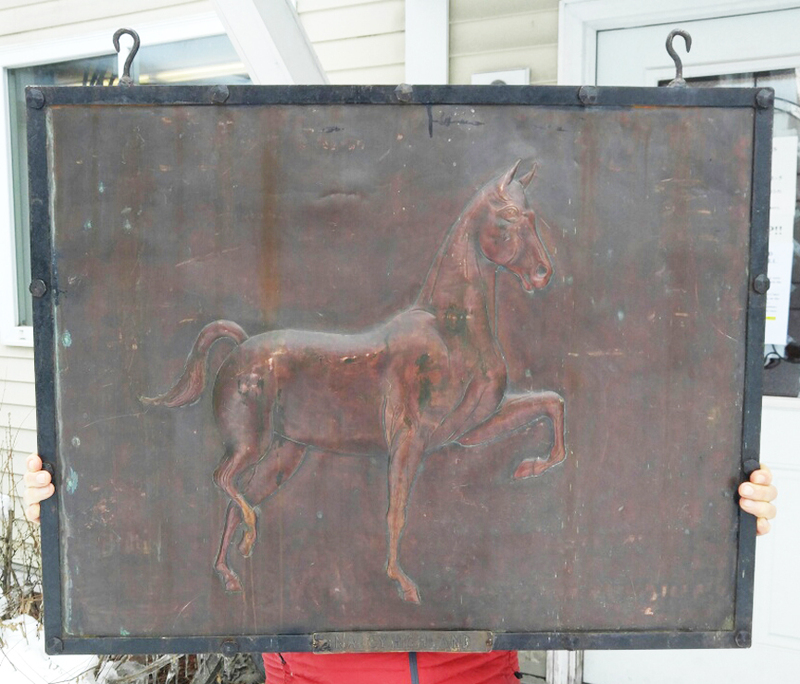 Estate copper horse sign in relief of golden chestnut mare, an American Saddlebred horse, Nancy HIghland who was foaled May 8, 1915, having the original Nancy Highland name plaque on the bottom. 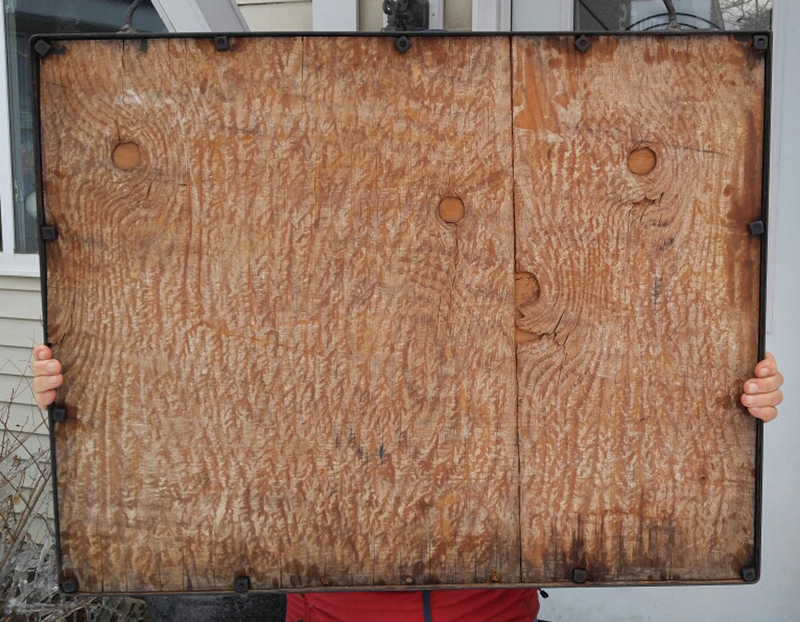 A fabulous sign in great condition, having the normal nicks and marks normal for age. 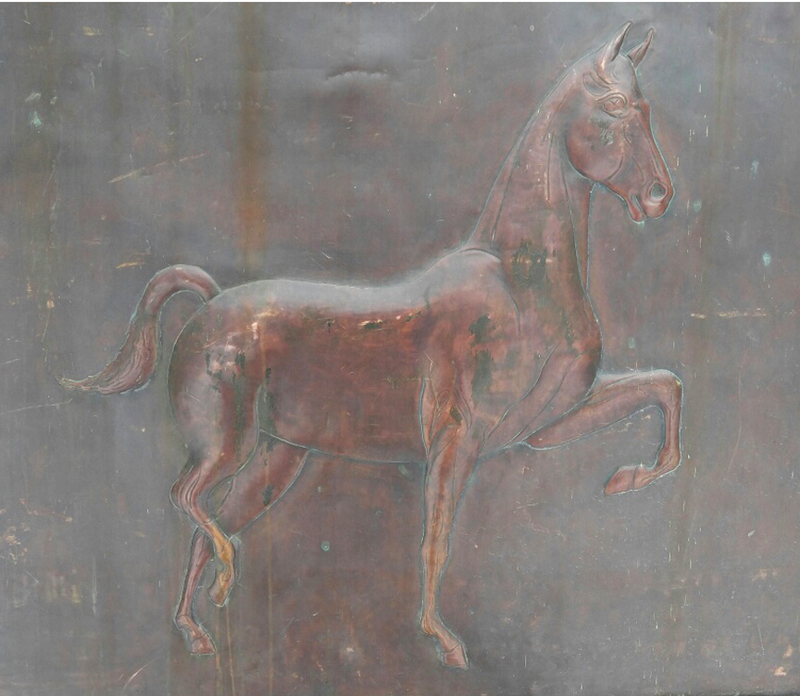 According to the American Saddle- Horse Breeders Register, page 320, entry #13043, Nancy Highland was a chestnut mare, blaze with four white feet, Bred by S. P. Berryman, Nicholasville, Ky.; foaled May 8, 1915. The sire was Highland Artist 3295, by HIghland Gay 1149, by HIghland Denmark 730. Dam, Bess Cox 4876, by Harrison Chief, Jr. 2365; 2nd dam Sue B. by Eurika Lad; 3rd dam Mollie, by Peavine 85. Property of Mrs. J. E. Jacoby, Louisville, Ky.
Later sold to Mrs. Eva M. Skipper of Illinois. Won Grand Champion Sweepstakes in Mt. Vernon, Illinois, plus many other awards. This Nancy Highland copper stable sign was found in a barn in Woodstock, Vermont and was probably accidently left behind after racing in Southern Vermont nearly a hundred years ago. It has a wonderful arts and Crafts iron frame. A must for any horse lover of important breeding. The main sign is 36 1/4 inches by 28 1/4 inches tall with out the hooks. 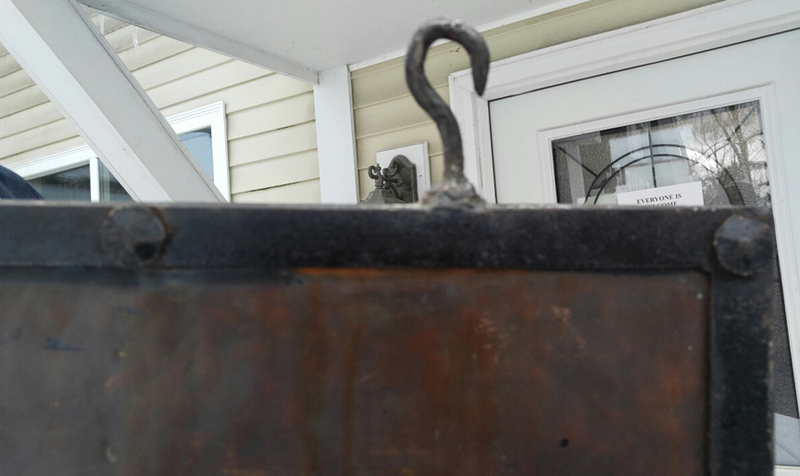 It is 1 1/8" deep and 31 1/4" high with the hooks. 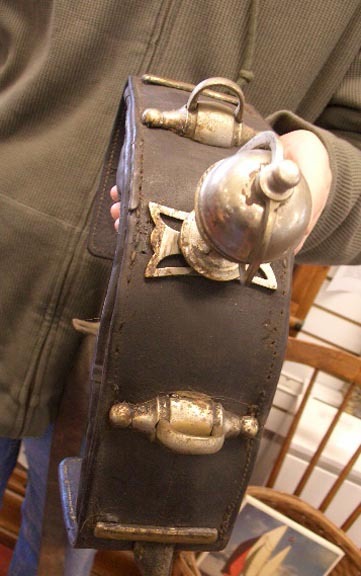 Great, all original, early Sirsingle top sleigh bell horse collar. 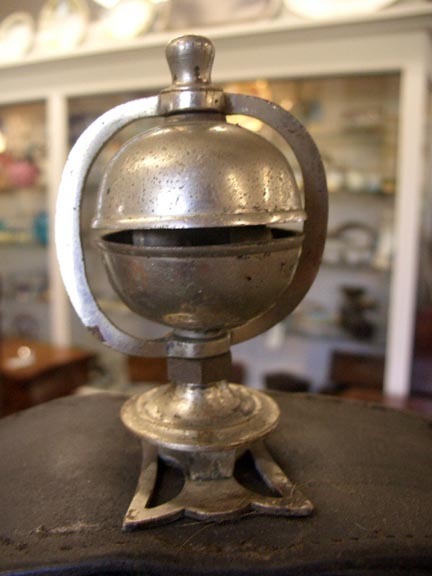 Circa 1880 and has original leather. Measuring 13" metal to metal and 4" wide. Try to find a piece as pure as this. 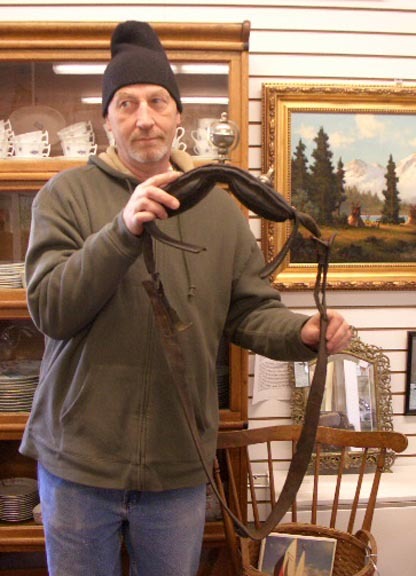 Great, all original, early Sirsingle top sleigh bell horse collar. 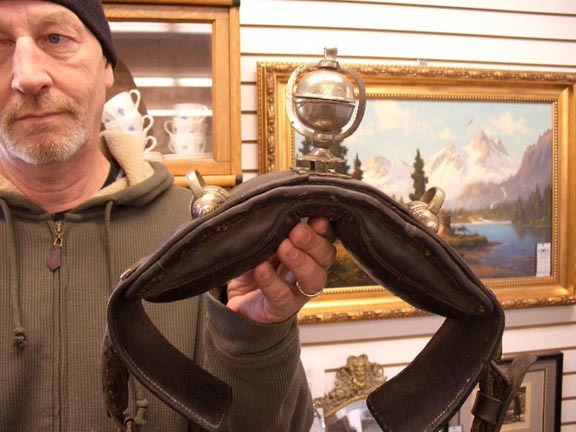 Circa 1880 and has original leather. 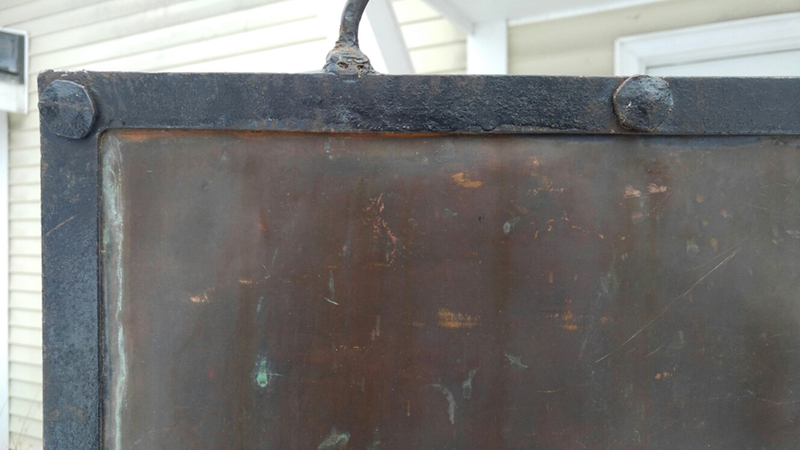 Measuring 13" metal to metal and 4" wide. Try to find a piece as pure as this.